STUCK IN L.A.: Rampaging Pigs at the Getty! Rampaging Pigs at the Getty! No, the title of this article is not in reference to the corruption scandals at the J. Paul Getty Museum, outrages that have resulted in the departures of Getty Trust President Barry Munitz and Getty Trust Chairman John Biggs. Nor does it refer to the ongoing trial in Italy of former Getty antiquities curator, Marion True, on charges of conspiring to deal in illegally looted art artifacts. Instead our headline refers to a scandal of a different type, one you will no doubt be hearing much of in the months to come - at least from this web log. The J. Paul Getty Trust has hired UK-based advertising moguls, M&C Saatchi, to rebrand its museums and galleries, hoping to make them "more accessible to a more diverse audience." Huw Griffith, CEO of M&C Saatchi LA, declared, "One of our namesakes, Charles Saatchi, is synonymous with art, not just advertising. In this case it's a happy coincidence, but working for the Getty everyday will be a great opportunity to express our interest in art." Griffith went on to say, "The Getty is world famous and we look forward to developing a big idea borne out of our Brutally Simple Thinking approach." And how has this "Brutally Simple Thinking" been implemented so far in the quest to reach out to the people of Los Angeles? Why, by insulting people’s intelligence and pandering to the lowest common denominator of course! 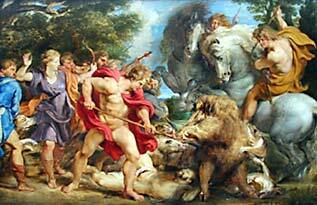 M&C Saatchi LA has designed a public billboard that showcases The Calydonian Boar Hunt, a Rubens painting circa 1611, acquired by the Getty in May. 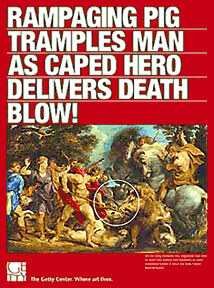 The billboard features a ridiculous headline in bold upper-case type, fashioned after the lurid banner headlines and melodramatic captions found in the tabloid press; the sensationalist billboard screams - "RAMPAGING PIG TRAMPLES MAN AS CAPED HERO DELIVERS DEATH BLOW!" In explaining the crude tabloid approach, the M&C Saatchi LA CEO said: "How often have you stood in front of a painting and wondered what was going through the artist's mind? When these works of art were created they were the main medium of the day - they set out to tell a story to an audience in an often dramatic way, just as the media does today. The tabloid-style headline looks to express what the subject portrays, had it been created for today’s audience." That the CEO of a major advertising agency could compare the narrative power of paintings by the Old Masters to the scandalous and sordid headlines of today’s worthless throw-away papers, is another indication of the all-time low postmodernism has brought us to. In our opinion, "Brutally Simple Thinking" has little to do with art - one of the highest achievements and endeavors of the human race - and everything to do with being a thoughtless beast. Minimalism in art is one thing, but to be stripped of humanity by minimalist thought is something else altogether. "Brutally Simple Thinking" belongs to the generals, politicians and corporate executives of this world - but it should not be in the lexicon of the artist. It is inexcusable that M&C Saatchi LA would address the general public as a mass of excruciatingly stupid, tabloid-reading vulgarians, a mob incapable of comprehending art. But then, what can be expected from a mercenary ad agency? The M&C Saatchi LA CEO said "the name of Saatchi is synonymous with art", and while it’s true that advertising giant Charles Saatchi launched the career of postmodernists like Damien Hirst and his animals pickled in formaldehyde - we’re left wondering what the Getty thinks they’re getting out of the deal. So far the "Rampaging Pig" billboard has been posted in only one location, the food court at L.A.’s Century City shopping mall, but Mara Benjamin, the Getty’s assistant director of marketing and advertising, says we should expect more images and headlines to show up in publications by late fall - as well as more outdoor billboards. We hope that the Getty and M&C Saatchi LA will come to their senses - but we’re not holding our breathe. Welcome to the web log of the L.A. Stuckist group. We are Remodernists seeking the renewal of spirituality and meaning in art, culture and society. We wish to build an international art movement for new figurative painting with ideas. We stand against the pretensions of conceptual art - we are anti anti-art. Eric Hebborn: Who's Fooling Who? Stuckistas: "South American Art Bandits"
Thomas Kinkade, Stuckist or Crap?